Let's start 2016 with a bang. Starting slightly off topic, I wanted to get this out sooner, but I had a huge chunk of this coded out and then youtube completely crashed my computer, losing a lot of work, so I raged quit and took a day off. 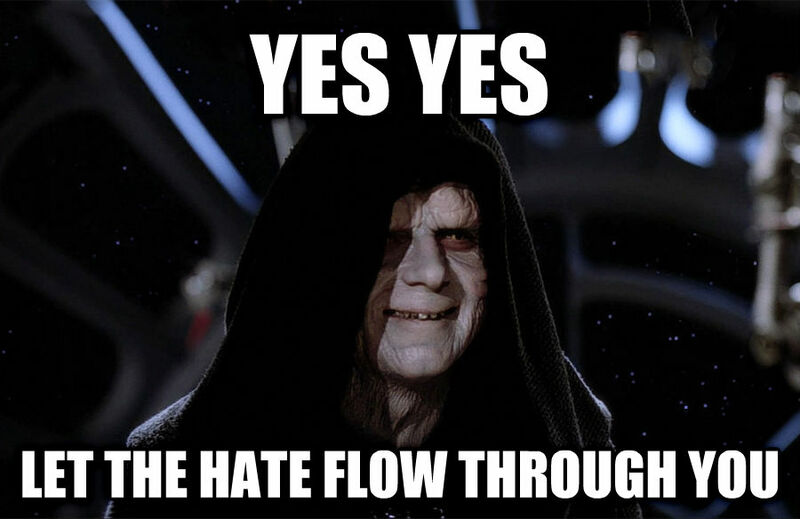 Now I've calmed, here we go. There is actually more equipment updates to come, so to make them easier to digest, I've split the equipment updates into two parts, this is part one. The equipment system on Reign Of Blood has been the way it is for long time (excluding the adding of new types), and I think it's time to shake it up a bit. So today, I have launched an updated equipment system that you all can enjoy. 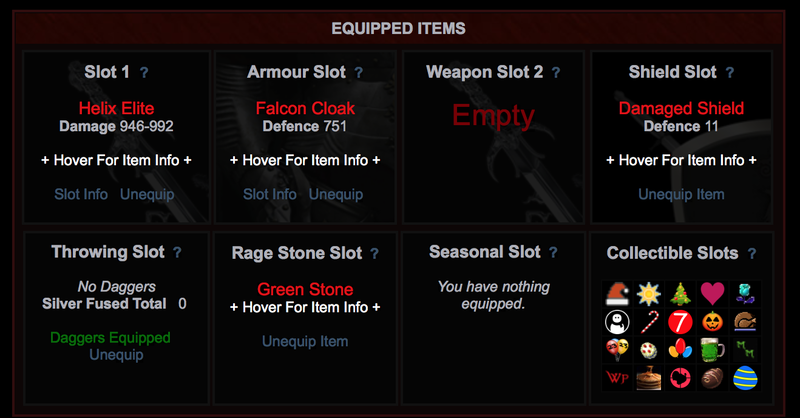 Firstly, we have an updated look for the equipment page to make room for the changes listed on this post. Sharpness - Equipment now has extra damage/defence boosts in the form of sharpness. Think of this as a type of durability, but the equipment never breaking, just ceasing to give you any boost. The sharpness boost increases the maximum damage/defence range your item can do. For example if you have a weapon that does +500, with a sharpness bonus of +50, you'll do 500-550 damage. But keeping your item sharp (via Dead City's Repair Center) will destroy that range and just give you 550 damage. That is of course is until the sharpness slowly fades away. Think of it as a 10% boost on top of equipment that requires a bit of TLC. Equipment stat: LUCK - Equipment now has its very own stat: Luck. Luck can determine which end of the damage range you hit. The higher your luck, the more chance you have hitting the damage in the higher end of your range when your equipment is not fully sharp. Luck can be increased at Thermoden. The equipment page has been tweaked to make room for these new features. 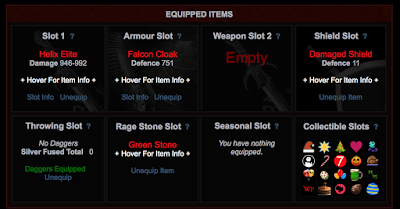 I've made it a little more compact, and added a few more stats onto the hover over section of the items. I have also made it very clear an item's base damage, and full damage range, so you can see exactly how effective an item is. I have also added 3 new pages on the equipment page. One is a guide page to show where to buy all the different types of equipment, another that is a general guide to how all these equipment features work, and finally an upgrade/repair check page that checks all your equipped items to see if any need repairing or can be upgraded. I know some of you love using shields. So, I've done a couple things. Firstly, I have added some new higher powered shields at Thermoden's Shield Warehouse. Secondly, a new location at Thermoden now allows you to unlock the ability to use a shield in your primary weapon slot instead of a weapon. I've laid all this out on the equipment page as simple as possible, and I think you'll like the depth this adds to our equipment. I've started this thread for feedback and questions. See you next week for part 2!